When Bob Jones from Skycrane offered to send me one of his new portable jib arms to review, I was happy to accept. I'm always looking for ways to do new and better things with video, and I figured a jib arm ought to give me many more angles and camera moves than just the basic handheld or tripod shots. But first things first: if you're new to video or film production, you may wonder what a jib is. 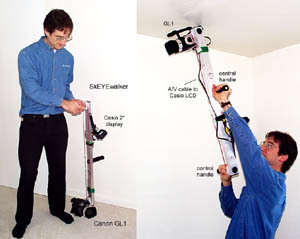 jib arm: A counterbalanced centrally-mounted beam, supporting a remotely controlled camera at its far end. Think of a teeter-totter that can swivel around sideways as well as see-saw up and down. The camera is on one end, the operator is on the other. 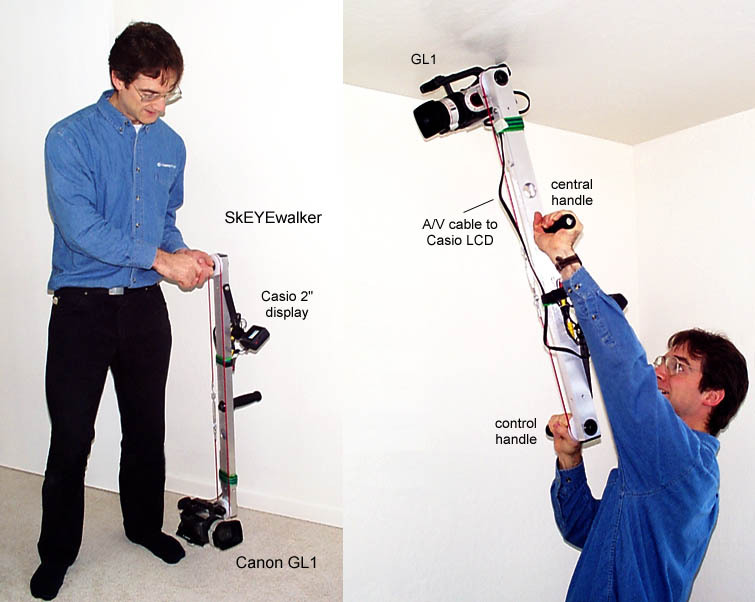 A traditional jib arm is supported in the middle by a sturdy tripod or pedestal (either fixed or on a dolly), and allows the camera to swing up and around in a wide arc. The Skycrane company also sells this kind of traditional jib, but the "Skeyewalker" jib is different. You carry it entirely by yourself, with one hand supporting the central pivot point and the other (nearest handle) controlling the angle of the camera. It is very solidly constructed of a three foot long rectangular aluminum tube, 1"x2" in exterior dimension, with two handles and a camera platform, in all about 5 pounds (without camera or external monitor). At either ends are pulleys which turn on ball bearings. The control handle turns one pulley which rotates the far pulley and camera platform by means of a loop of cable running the length of the arm. In the photographs below, I have mounted the Canon GL1 camera on the jib, adding a Casio 2" LCD (CamVision model VM-50B) display screen near the other end as a monitor. As you may appreciate from the photographs, you can achieve both ground-level and overhead camera angles using the jib. Rotating the control handle rotates the camera by the same angle, and nothing on the jib prevents you from rotating the camera a full 360 degrees (for example, pitching straight down, upside-down backwards, straight up, and level again). With the A/V cable to an external display, there are some limits depending how much slack you allow in the cable. Bob had his own Casio 2" LCD which did not work well for him, but I found mine useful and had no problems with it. You can also use the flip-out LCD screen on your camera, but in use it is often at the wrong angle for proper viewing. The jib is reconfigurable, in that you can adjust for right or left-handed operation, and move the central handle to one of two positions for different leverage and reach. You can also reverse the positions of control and camera platform bearings, effectively giving you a third relative position for the central handle. There are several 1/4"-20 tapped holes in the arm near each end for mounting accessories. 1) Putting the camera very low to the ground and moving forward really gives you the impression you are seeing through the eyes of some small animal, an interesting effect. This is easy with the jib. 2) A low camera tilted up to watch people pass by is an unusual angle and can add variety to your video. It would be convenient if you could actually rest the end of the jib on the ground in this position (currently the rotating camera platform is the lowest point). Bob informed me that he plans to make a design change to permit this, in the next manufacturing run. 3) You can definitely achieve high angles as in the right-hand photo above, but this can become tiring quickly as the jib weighs about five pounds, exclusive of the camera. On wide angle and using steadyshot, I can get reasonably stable high-angle shots for at least five seconds. Much beyond that, fatigue sets in. 4) The most exciting possibility I thought the jib would offer is dynamic shots- for instance, starting with a high angle pointed nearly straight down at the subject, then arcing down and around ending up near floor level. This shot is simply not possible without a jib, unless you happen to be eight feet tall. The good news is that this is indeed possible, but so far, I have great difficulty in maintaining a perfectly steady shot throughout the camera motion, even at wide-angle and with the help of the GL1's quite effective optical steady-shot mechanism. The still below is from a little movie I made with two cameras; the main frame from the jib-mounted GL1, the inset from a second camera showing my position relative to the subject (click on the frame to see more). Only briefly was I ever able to get smooth, tremor-free video while moving the jib. While holding it at one elevation, I could do fairly well. 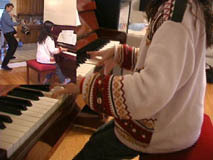 Download piano1.mpg from this site In general, I found a full wide-angle setting to be most useful- this makes low angles more dramatic, and reduces the effect of hand tremors in the video frame. The TRV900 is rather front-heavy even without a wide-angle adaptor on the front; with it, the camera wants to tilt downward even more strongly, and this must be counteracted with a firm grip on the control handle. The GL1 with BP-930 battery is only slightly front-heavy. My conclusion is that the jib is quite useful for low-angle shots, good for the occasional high-angle fixed shot, and possible but difficult to use for transitioning shots (eg. moving high to low, or the reverse). For smooth jib or crane type shots you probably need a fixed pivot point, rather than handheld. I'm planning to experiment further with it and I'll let you know how it goes.